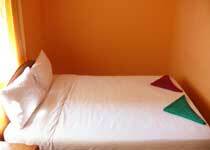 Single room with fan is peaceful,large,clean .It has a big screen window with a beautiful curtain,private bathroom(hot and cold water shower,shampoo,soap,tooth-paste, tooth-brush),fridge,large screen cable TV.Free WiFi(inside the room) and Free Internet Service. if you would like us to pick you up from where you arrive , could you please tell us about the name of bus or boat or airline company and arrival details ( the departure time from where you leave to come to Siem Reap).So it makes us easy to know where we can pick you up.Upon your arrival you will see your name written on our guesthouse signboard. You will feel comfortable with our service. Double room is peaceful,large,clean .It has ,a big screen window with beautiful curtain, private bathroom(hot and cold water shower,shampoo,soap,tooth-paste, tooth-brush),fridge,large screen cable TV.Free WiFi(inside the room) and Free Internet Service. 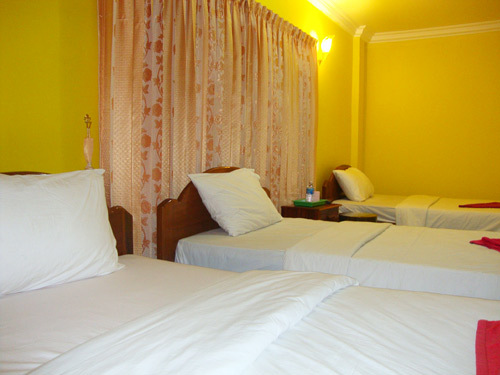 Twin room is peaceful,large,clean .It has a screen window with beautiful curtain, private bathroom(hot and cold water shower,shampoo,soap, tooth-paste and tooth-brush),fridge,large screen cable TV.Free WiFi (inside the room) and Free Internet Service at the lobby. Triple room is peaceful,large,clean .It has a big screen window with beautiful curtain, private bathroom(hot and cold water shower ,shampoo,soap,tooth-paste and tooth-brush),fridge,large screen cable TV.Free WiFi (inside the room) and Free Internet Service at the lobby. The single room is quiet,large,clean.It has a big screen window with curtain, private bathroom(hot and cold water shower ,shampoo ,soap, tooth-paste and tooth-brush),fridge, large screen cable TV.Free WiFi (inside the room) and Free Internet Service at the lobby. 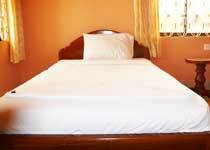 The room rate includes :a free bottle of water daily.Free pick-up from airport,ferry,bus station. 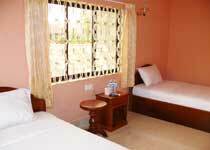 The Double room is quiet,large,clean.It has a big screen window with beautiful curtain, private bathroom(hot and cold water shower,shampoo,soap,tooth-paste and tooth-brush),fridge, large screen cable TV. The room rate includes :a free bottle of water daily per person. 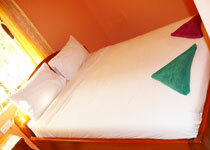 Free pick-up from airport,ferry,bus station..... .Free WiFi (inside the room) and Free Internet Service at the lobby . The Twin room is quiet,large,clean.It hasa big screen window with beautiful curtain, private bathroom(hot and cold water shower ,shampoo,soap,tooth-brush,tooth-paste),fridge, large screen cable TV. Fee WiFi (inside the room) and Free Internet Service at the lobby. 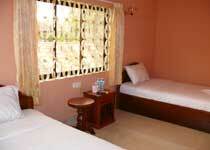 The room rate includes :a free bottle of water a day per person.Free pick-up from airport,ferry,bus station. Triple room is peaceful,large,clean .It has a big window with beautiful curtain, private bathroom(hot and cold water,shampoo and soap,tooth-paste and tooth-brush),fridge,large screen cable TV ,.Free WiFi (inside the room )and Free Internet Service at the lobby.